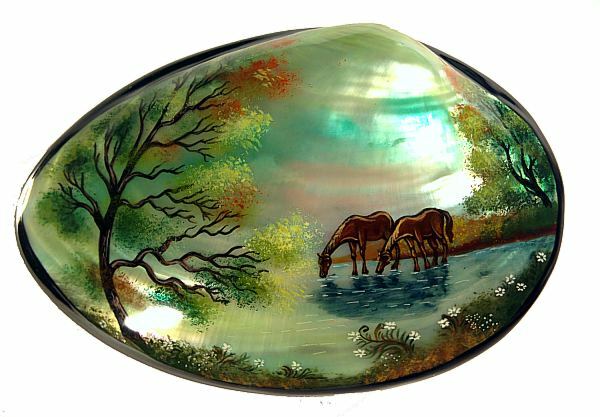 The box owes its unusual shape to an abalone shell, from which its top was made. 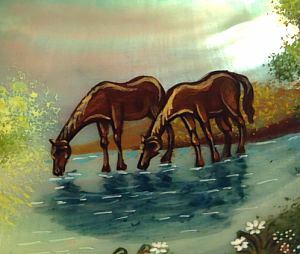 Depicted on it is a peaceful autumn landscape, with two horses lowering their heads to drink. The light falls on them from the base of the shell in gentle rainbow mother-of-pearl overflows, imparting a dreamy, other-worldy aura to this composition. Delicate white flowers cover the foreground of the painting. The bottom part of the box and the part surrounding abalone shell on the top of the box are made from high quality papier mache. The box is elevated slightly above the surface by the sculpted edges, which are decorated with small gold ornaments. The hinge is at the top of the box. The bottom half of the box on the inside is red, while the top retains the original abalone shell coloring. The bottom of the box is signed with the names of artist, village, and composition. Lacquer is in very good condition.